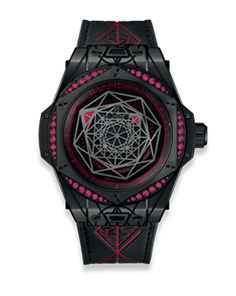 The whirlwind was finally presented in the range Big Bang Sapphire Crystal during Basel World 2018. Proud of its 5 days power-reserve, the ‘Big Bang Tourbillion Power Reserve 5 Days’ (405.JX.0120.RT) is sort of a symbol of Hublot’s innovation thanks to its dial, bracelet and movement, all transparent. On the model with the usual diamonds indexes only the case was in white gold and set with diamonds of the size of indexes, but with this model the bezel is made out of sapphire glass and a new method has been used to set the diamonds inside the glass. The glass sapphire is a strong and resistant material, but it means that the difficulty of the treatment is really high. 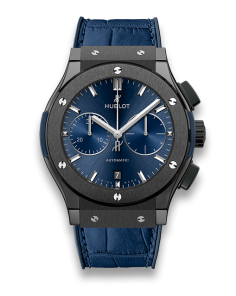 However in the development and moulding of the sapphire crystal, Hublot that always was a pioneer, made possible this treatment that seemed impossible. 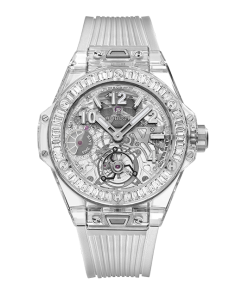 In the collection ‘Big Bang Tourbillion Power Reserve 5 Days’ in addition to the model with diamonds indexes (405.JX.0120.RT), a model without diamonds (405.JX.0120.RT.1904) have been presented at the same time.